Robert Wilhelm Eberhard Bunsen (March 31, 1811 - August 16, 1899) was a German chemist who contributed to the development of spectroscopy as a powerful method of chemical analysis. The bunsen burner, a lamp that provides a clean flame for chemical analysis and laboratory work, is named after him. Bunsen also made major contributions in the areas of metal isolation and purification and in the handling and analysis of gases. Bunsen was the youngest of four sons of Christian Bunsen (1770–1837), chief librarian and professor of modern philology at the University of Göttingen. Bunsen graduated from the Gymnasium at Holzminden in 1828, and went on to study chemistry, physics, mineralogy, and mathematics at the University of Gottengen. Among his teachers was Friedrich Stromeyer, the discoverer of the element cadmium. Bunsen received a doctorate in 1830. A government grant allowed him to tour Germany, during which he was able to meet the top German researchers in chemistry and physics and survey the country's industrial and manufacturing plants. In 1832, Bunsen went to Paris and worked in the laboratory of Joseph Louis Gay-Lussac, the famed physicist. After his return to Germany in 1833, he became a lecturer at the University of Göttingen and began experimental studies on the (in)solubility of metal salts of arsenious acid. His discovery of the use of iron oxide hydrate as a precipitating agent is still the best known antidote against arsenic poisoning. In 1836, Bunsen succeeded Wöhler at the Polytechnic School in Kassel. After teaching for two years, he accepted a professorship at the University of Marburg, where he studied the derivatives of cacodyl, an arsenic-bearing compound. During this research, he was injured in a chemical explosion and lost his sight in one eye. His accident, however, did not prevent him from pioneering methods for analyzing the chemical constitution of gases. In 1841, Bunsen created a battery with a carbon electrode that was more economical than the platinum electrode used in Grove's battery. Around this time Bunsen also investigated the various industrial processes for making steel, and suggested ways of recirculating the hot gases expelled, to conserve heat and save valuable byproducts, such as ammonia. In 1846, Bunsen traveled to Iceland, and took samples of volcanic rock, which he analyzed and concluded that they were composed both of acidic and basic minerals in varying degrees. After assuming a professorship at Heidelberg in 1851, Bunsen, using nitric acid as an electrolyte in his battery, was able to produce by electrolysis pure metals such as chromium, magnesium, aluminum, manganese, sodium, barium, calcium, and lithium. He collaborated with Sir Henry Enfield Roscoe to study the formation of hydrogen chloride from hydrogen and chlorine in the presence of sunlight. He also achieved the purification of rare earth metals such as cerium, lanthanum, and didymium, and developed an ice calorimeter that required only a small samples of a substance to measure its specific heat. (Specific heat is the comparative ability of a substance to absorb heat for a given temperature change). In 1859, Bunsen joined Gustav Kirchhoff to study emission spectroscopy of heated elements, known as spectrum analysis. Bunsen (or his laboratory assistant Peter Desaga) had in 1855, perfected a special gas burner, originally developed earlier by scientists Michael Faraday and Aime Argand, that allows oxygen from the air to mix with an inflammable gas, making for a hotter and cleaner-burning source of heat for laboratory experiments. Bunsen was working on the analysis of compounds through the colors they produced when heated in a bunsen burner. But Kirchhoff convinced him that analyzing the spectra (the colorful light pattern that results from passing the light through a prism) of the heated substances was a better approach. It was already known that dark lines appeared in the spectrum of the sun, called Fraunhofer lines, after the scientist who first analyzed them in detail (Joseph von Fraunhofer). Bunsen and Kirchhoff noticed that when sunlight that passes through the heated vapor of sodium chloride is analyzed, some of the Fraunhofer lines become darker. These lines are the same that appear as bright lines when the light from heated sodium chloride alone is analyzed through a spectroscope. From this, they concluded that a substance will absorb the same frequencies of light that it transmits when it is heated. A corollary of their findings was that the dark lines from the sun's spectrum were due to the sun's light passing through its own atmosphere, which had absorbed those frequencies before the light reached earth. Bunsen and Kirchhoff applied this new understanding to the analysis of the composition of compounds. It led them to the discovery of two new elements by spectral analysis alone: Cesium in 1860, and rubidium in 1861. It also opened up a way for detecting the presence of elements in stars. Bunsen remained in Heidelberg for the rest of his career. He was known as one of the best teachers in his field. Many of his students continued his research and became famous for their achievements. They included the chemists Adolph Kolbe and Edward Frankland, who extended Bunsen's researches. 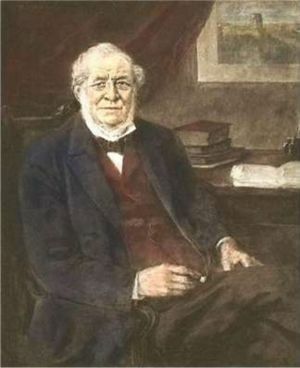 When Bunsen retired in 1889, he shifted his work solely to geology and mineralogy, interests which he had pursued throughout his career. He died August 16, 1899. Bunsen clarified the chemical reactions that result in the explosive force of gunpowder, leading to further improvements in the field of explosives technology. He joined the Chemical Society of London in 1842, and the Academie des Sciences in 1882. He was a fellow of the Royal Society of London (1858), and was awarded their Copley Medal in 1860. He and Kirchhoff were the first scientists to receive the Davy Medal from the Royal Society of Great Britain in 1877. Von Meyer, Ernst. 1906. A History of Chemistry, tr. George McGowan. New York: The Macmillan Company. This page was last modified on 18 March 2013, at 22:01.